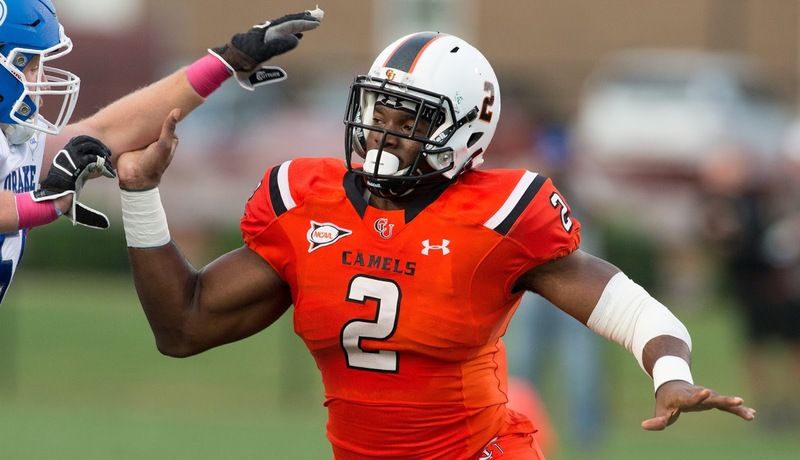 BUIES CREEK, N.C. – Ugonna Awuruonye has been named STATS FCS National Defensive Player of the Week after posting 3.0 sacks and 10 tackles in a win over Drake. Already the Pioneer Football League's Defensive Player of the Week, Awuruonye tied a Campbell single game record with his 3.0 sacks on the night. Awuruonye's 3.0 sacks in Campbell's 24-14 win over visiting Drake tied Isaac Scott's Campbell single game record (10/20/12 vs. Davidson). The CU defense gathered a program record nine sacks in the win. He also set the Campbell career sacks mark, now owning 19.0 in his three year CU career. Awuruonye also extended his school tackles for loss record to 31.5. The Camels sacked Drake quarterback Andy Rice seven times in the fourth quarter, and was thrown for losses three of the final four times he dropped back Saturday night. Campbell held Drake to just 154 yards, defeating the Bulldogs for the first time after dropping the first five games in the series. Campbell is 3-0 at home so far in 2015. Darmouth’s Dalyn Williams was named STATS Offensive Player of the Week, while Khris Gardin of North Carolina A&T garnered Special Teams Player of the Week accolades. Loren Easly of Stephen F. Austin was tabbed the Freshman of the Week. Awuruonye was also named the Pioneer Football League’s Defensive Player of the Week. Campbell returns to action next Saturday (Oct. 10) with a 6 p.m. kickoff at home vs. Marist.